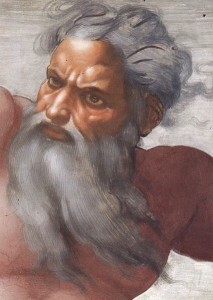 The face of God as depicted by Michelangelo in his painting at the Sistine Chapel. The New Testament teaches that war or the use of force to impose one’s will unto other countries has greed as motive not the desire to spread the good news of the Gospel. There is absolutely no support for holy war in the New Testament but that hasn’t prevented politicians from launching wars of choice and recruiting support for it from church leaders. The preachers that support war are likened to the beast that has two horns like a lamb but speaks like a dragon Revelation 13:11. Jehovah has an ancestor: the desert god of war. Christianity was born of an argument between two groups of Jews, and argument that turned into real hostility. Indeed, anyone reading the history of Christianity for the first time might be hard pressed to distinguish it from antisemitism. Late medieval Christianity is a horror of persecution: when it finished with the Jews, it started in on women. And don’t even get me started on heretics. American Christians certainly demonstrated their taste for violence, bloodshed, and death by crucifixion in their passion for Mel Gibson’s *Passion*. I hope this new and improved generation of Christians have an idea about how to deal with that. I should have made clear that I am referencing early Christianity, not what it has become. “Christians are Jews for Jesus but they donâ€™t know it.” Hillary is right on both counts here. My apologies for not noting this earlier, although I would say “the great majority” of Christians do not know it. Rehmat: You are a graduate of a Catholic mission school?? Do they give certificates of achievement for sleeping through class? I am not a Catholic, but you did not get the stuff you come up with in Catholic mission school. Christians are Jews for Jesus but they don’t know it. Every religion must war against those who do not agree to the group think of group values. All religion is organized behavior control. Every religion is based on bigotry, the belief that one religion is superior to all others and other cultures are inferior to that religion. Such belief promoted slavery and genocide, paranoia and violent defense of unprovable tenets of faith. Orthodoxy demands blind belief in autocracy. There is no room for questioning because there is no need for questioning when answers are supplied by faith a source of knowledge unknown to free humans. and if you ‘choose’ to believe that women are to keep silent in church, that it’s okay to burn a person as a witch, kill your son if he displeases you, slaughter your son by cutting his throat on a pyre because God told you to (as a test), that you can’t eat shellfish, or wear mixed fibers, are you going to think that’s okay? Or are you going to use your god-given reason to take your child to a doctor when s/he is sick because medical science can help. Or maybe there is no god and no jesus. You see, you can’t just close your eyes and I believe it and that ends it. Not if you want to live in this century. It’s easier if someone tells you what to believe. Plenty of televangelists out there will tell you you are special because of your beliefs. As for distinguishing between the Christian and Hebrew Bible, Jesus was born and died an observant Jew. He never meant to start a new religion. He came to ‘fulfill the Law.” How convenient that his words, redacted in 200 years later, are so ambiguous. Believe what you want but don’t bring your religion into my children’s schools or into my doctor’s office when I have a fetal death and want an abortion. We’re Americans. Let’s keep church and state separate. All I know is that the message of Christ in the New Testament is what I believe and choose to follow. It may be wrong, but I do not even consider the Old Testament as something to live by. @Rehmat, No one knows what Jesus said or believed; the gospels which supposedly record his words were written decades after his death, by people who had not met him. Christian doctrine is unclear, which is why Christianity has been characterized by disagreement and heresy since its inception. Christianity led to war; as a monotheistic belief dependent on conversion it was tailor-made to do so. “Zionism” is a historical accident created by 1600 years of Christian persecution of the Jews, by the disappearance of the Ottoman Empire, by the advent of the Brits in the Middle East after World War I. US evangelicals support Israel not because they are pro-Jewish (evangelicals believe that all non-converted Jews are going to hell) but because they are pro-Rapture. I’m not going to get into a big discussion here but will only say: The gospel tradition began with the very early church in Jerusalem (Acts 6). Jews (Jewish Christians) were extremely adept at preserving, handing on, and receiving precious tradition. The passing on of precious tradition was not a whisper chain in which the end bore no resemblance to the start. Thus the fact that the gospels were written decades later is not as strong an argument to discredit the reliability of their accounts as one might imagine. It is strange that secular historians are more positive about Jesus than religious scholars. The church lost its early unity when gentiles began substituting Greek philosophy for the tradition. If interested, check out Harald Riesenfeld, The Reliability of the Gospel Tradition, and Birger Gerhardsson, Memory and Manuscript, on the transmission of tradition. These guys have done some actual research. Rehmat is off by far on early Christianity. Christians prior to Constantine were indeed peaceful. All objective historians agree. The critic, Celsus (AD 180), was frightened that Christians would convert Rome’s leaders because it would leave the nation defenseless. Many Christians confessed Christ as Lord and suffered martyrdom rather than bow to the state. The more the state persecuted the church, the more it grew. It was after Constantine that the state forged links with the church, and the church went off the rails. And it has been off for 17 centuries except for pockets here and there that did not forget Christ’s example and teachings. You see ‘Zionists’ behind everything. Do you really think Germans of the WWI and II era were Zionists? Are you a holocaust denier? Perhaps we can agree that the entanglement of the Christian Right and the Republican party is indeed more than a ‘problem’ for both church and nation.